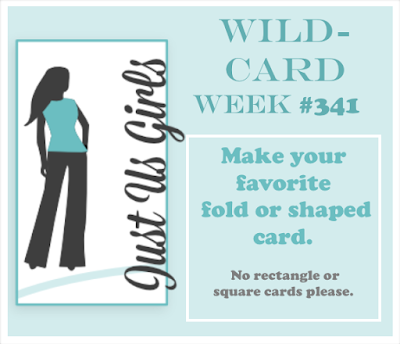 Since this is the 5th Saturday of the month, it's Wild Card Week over at Just Us Girls. 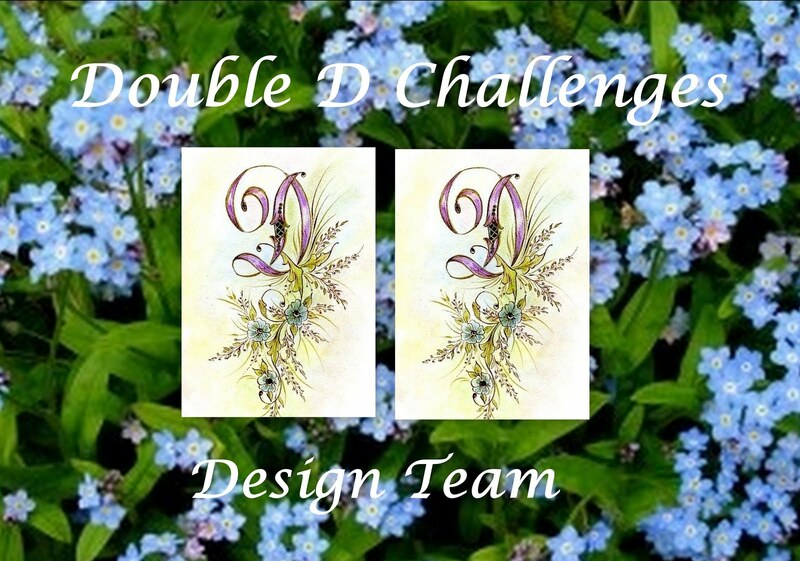 Ina will be our host, and she is challenging us to make our favorite folded or shaped card. Anything but square or rectangular. I chose to make a card by taking an hexagonal die and cutting out a folding piece of card stock, leaving the top edge joined. The images are from a MFT Stamp/Die set called Strike Up the Band. Aren't those little mice just so cute? Please visit the JUST US GIRLS blog to see the wonderful cards the rest of the team, and our April Guest Designer Angie Cimbalo, have made this week. I hope to see you there. 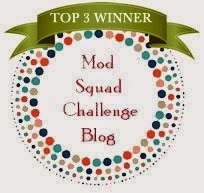 And remember, if you win Chic of the Week in any of our April challenges, you will be in the running to be chosen as our Guest Designer for the month of June!! Good luck, and thanks for stopping by!! Our sweet 8-year old grandson Caleb will be having his First Communion this weekend, and I wanted to make a gift card holder for him. This is not really a kid card because I wanted it to be a keepsake. I did some foiling with my laser printer and laminating machine. I had see this VIDEO by Becca Feeken some time ago and thought it was brilliant, so I used the technique on the cross. I LOVE how it came out. All the text has been computer generated, printed with my laser printer and then foiled in my laminator. This little card measures 3 3/4"x5". That's it for me today, appreciate your taking the time to stop by. I adore your comments!!! Happy Hump Day.....and it's sunny here to boot. Albeit chilly, but I will take it. So I was surfing Melanie Muenchinger's blog yesterday, looking for a technique I had seen her do some time ago, and I came upon this adorable card, and the VIDEO to go with it. I have been on a vellum kick lately, and remembered that I had this background stamp that would work well if I heat embossed the image on vellum with white. I kind of like how it turned out, and it was so much fun to use all those teeny, tiny stamps from Melanie's set, Triple Play Frame. Thanks for stopping by, my friends, I adore your comments. This is Photo Week at Just Us Girls. Bobby is our host, and she has chosen this wonder photo for our inspiration. 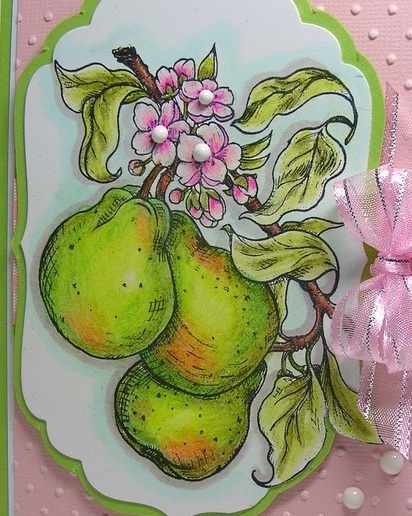 I have an old Flourishes stamp called Pears, and I thought of it immediately when I saw the photo. And the pink in the photo is so beautiful, and lends itself so well with that bright green. I colored these babies with my Prismacolors. No OMS, just a blender pen. Just a quick post tonight. I'm getting ready to go to Lansing to spend the weekend with the Princes and their mom and dad. We are taking the boys to the Grand Rapids Museum to see the Robot Exhibit. Good times. Himself is staying home with the dog. Today's offering was made for the Make It Monday Challenge over at Papertrey Ink. We were taught how to do faux watercolor lettering with some stamping, ink, and a paint brush. This was really fun to do, and not very hard. 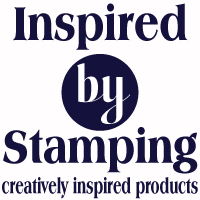 The main thing is to have the right kind of stamp. Thanks for stopping by, I adore your comments. Have a lovely weekend. Our challenge to you is to incorporate water in some way on your card. You may do this through water images such as raindrops, or use water-based mediums such as water colors. You get the idea. These cute little images are from the Kitchen Sink stamp set Multi-Step Rubber Ducky. I just think they are the cutest things ever! 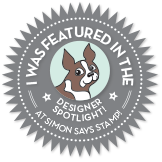 Here I used a die from Simon Says Stamp, Ring Frames. The background was watercolored with Brushos and sprinkled with salt for a nice texture. To finish it off I attached some sparkly sequins I filled with Glossy Accents. Thanks for stopping by, and don't forget to head on over to The Mod Squad Blog Challenge and play along. I can't wait to see your colorful creations!! Oh what a glorious day it has been here. And it's the second one in a ROW!!!! The snow is almost gone, just a little left in the ditches. Tomorrow I'm hanging out sheets on the line. using the inspiration tile below to make a yellow card. Isn't this just the most beautiful inspiration? 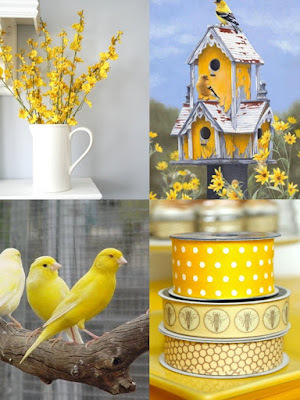 I was drawn to the tile on the top right, where that darling Gold Finch is perched atop the bird house. The finches around here are just getting their beautiful summer yellow finery, and I just adore them. I have colored the awesome stamp from the Winter Wings GKD stamp set. That stamp can be colored into a Chickadee, a Gold Finch, or any other bird that's small and finch-like. It's one of my all-time favorite sets. So that's it for me today. I hope you all had a wonderful weekend. Thanks for stopping by, I love your comments!!! 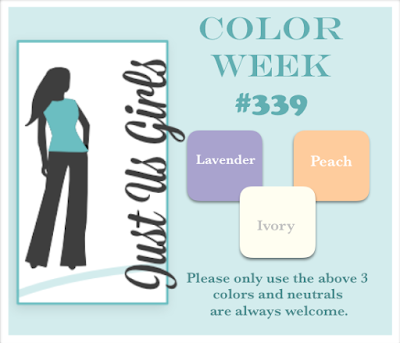 This week is COLOR WEEK at Just Us Girls, and I'm the host. It's my first time hosting and I am thrilled to pieces. 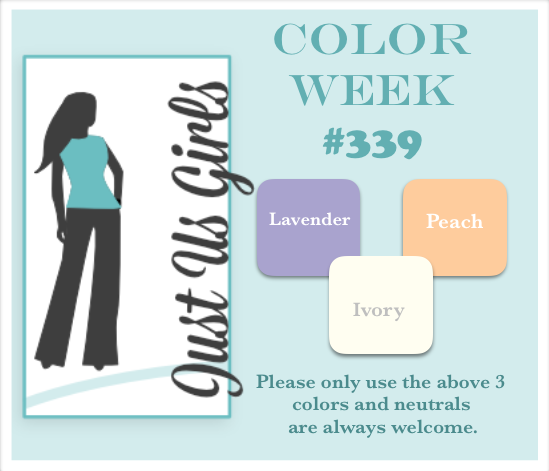 For my colors I have chosen LAVENDER, PEACH and IVORY. For this card I used the fabulous stamp set from Power Poppy called Springtime Love. I really like these colors together!! So feminine and pretty. My mom would have loved this, her favorite color was lavender, and she was all about "girly" things. I used my Prismacolor Pencils to color the image, shading peaches and lavenders together. I also used grays and browns to color the leaves, as in this challenge you can only use the challenge colors, plus light neutrals. 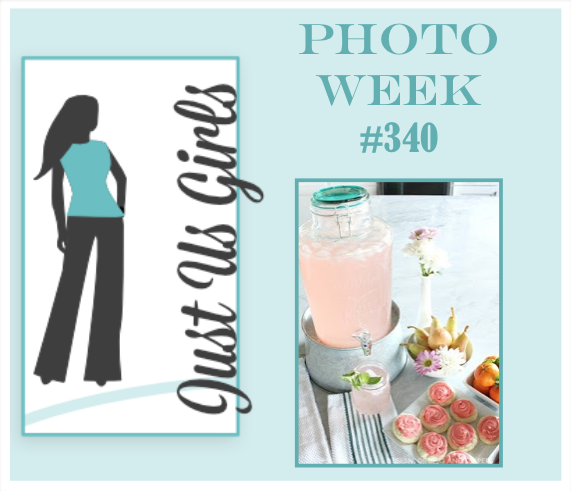 Please visit the JUST US GIRLS blog to see the wonderful cards the rest of the team, and our April Guest Designer, Angie Cimbala, have made this week. I hope to see you there. 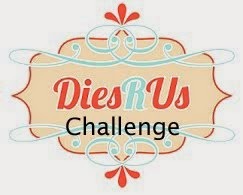 And remember, if you win Chic of the Week in any of our April challenges, you will be in the running to be chosen as our Guest Designer for the month of June. Good luck, and thanks for stopping by!! The Princes have left the castle. We had them for 5 delightful days, and it was such fun. And now I'm glad to be back in my craft room. Today's offering is for Papertrey Ink's Make It Monday. The challenge this week is Color Isolation. Have just a spotlight of color on your card. I did the background with Papertrey Ink's Friendly Flowers Stamp set, and also the focal. The background was stamped in Memento's Desert Sand Ink. I die cut the flower in GKD Dusty Rose Card Stock and the leaves in GKD Jelly Bean Green Card stock. Then I stamped the images with GKD ink. I like how it looks with the stamping on colored card stock. So thanks for stopping by, I adore your comments. Now I need to go rest. The Adored Ones wore me out...but in a good way. 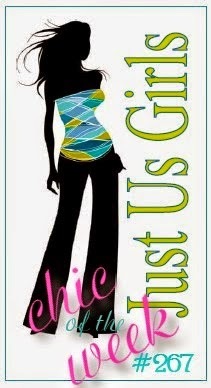 This week is TREND WEEK at Just Us Girls. Sue is our host, and she has chosen SMOOSHING as her trend. To SMOOSH you simply apply ink to an acrylic block or to your craft sheet, spray with water, and then "smoosh" your card stock into the color. It's probably my most favorite technique - you never get the same look twice. I stamped the image and greeting from A Life She Loved Stamp Set by Taylored Expressions, and then I masked the image with frisket (liquid masking fluid). I used Distress Inks on my craft mat, sprayed with water, and just kept smooshing and drying in between until I got the effect I wanted. Isn't it "artsy"???? Ha ha!!! Then I rubbed the masking fluid off and painted the image with my Zigs. Another snowy Sunday afternoon in Northern Michigan. But I digress....lol. I made this card for the Stamp TV Mix It Up Monday Challenge. 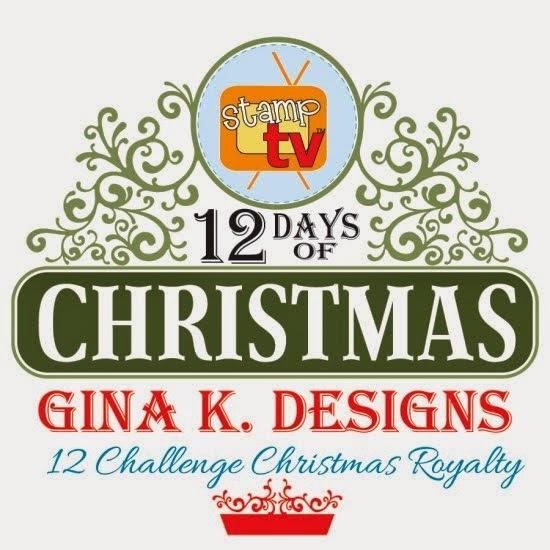 I entered my very first challenge ever, anywhere, over at Stamp TV on May 6, 2011. I had watched many of Gina's videos and was in love with her cards. Before that I didn't even know there was such a thing as a card challenge. And the rest is history. 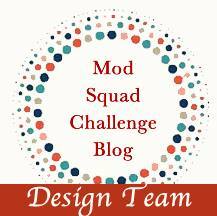 Now I'm on the design team for two wonderful challenge blogs, and I'm having a ball. 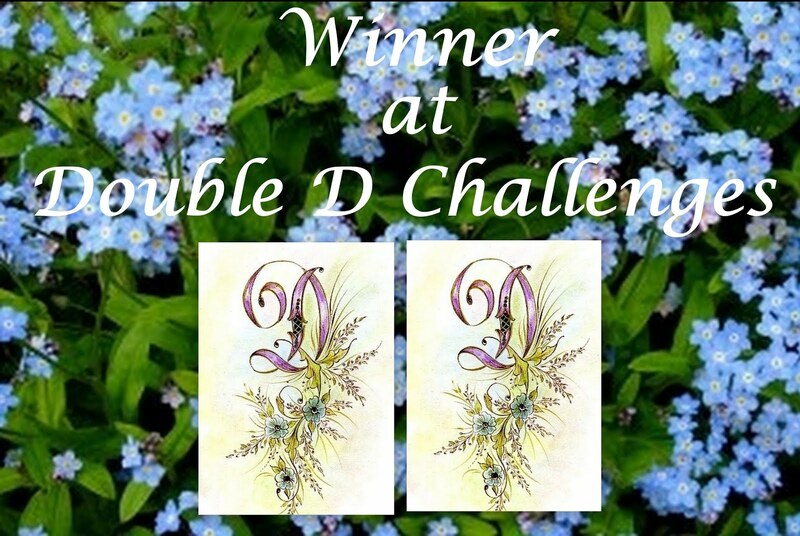 The challenge was to make a humorous card, or something that would make the recipient smile. I guess this would do the trick, it's the best I could come up with. Thanks for stopping by, I adore your comments. Hope your weekend was wonderful!!! Hope you are having a great weekend. Today's offering was made for the Power Poppy April Shower and Spark. This challenge runs all month long. I adore this new digi stamp, illustrated by Marcella Hawley. She is the owner of Power Poppy, and her work is just beautiful. For this challenge we are asked to pick only 3 marker colors to do the entire image. I chose Copics V22, YG93 and B21. These are all fairly light colors, but with Copics you can do layers to get more depth. For the tulips I colored them first with the violet color and then to intensify the shading I went over parts again with the blue. I love the way they turned out. Not many supplies needed for this one. I totally enjoyed coloring this and had forgotten how much fun Copic Markers can be. I have been doing a lot of watercoloring and my Copics have been sadly neglected. Thanks for stopping by, I adore your comments. 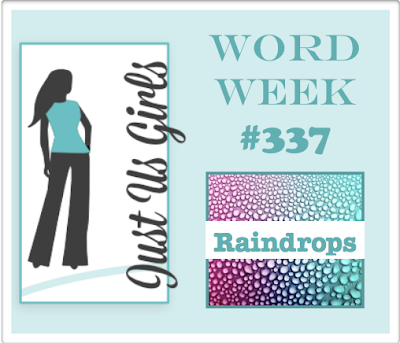 This week is WORD WEEK at Just Us Girls. Our host is LISA, and she has chosen the word RAINDROPS. I would like to welcome Angie Cimbala as our Guest Designer for the month of March. Welcome, Angie! 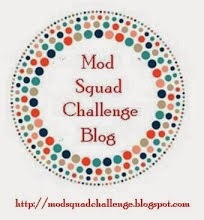 Please visit her blog and leave some love. I love this cute little image from Penny Black. Unfortunately I don't know the name of the stamp set, it's very old The raindrops are from a set by Ryn, LOVE her work. I heat embossed them with white and sponged the background with Memento Summer Sky. Then I attached some sequins and filled them with Glossy Accents to make them look like raindrops falling off the flower "umbrella". 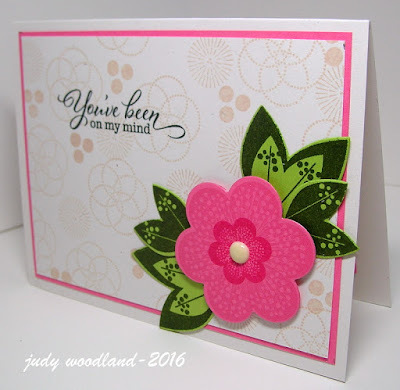 Please visit the JUST US GIRLS blog to see the wonderful cards the rest of the team, and our Guest Designer Angie Cimbala, have made this week. I hope to see you there. 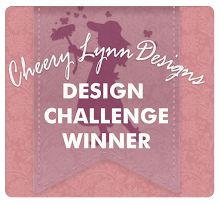 And remember, if you win Chic of the Week in any of our March challenges, you will be in the running to be chosen as our Guest Designer for the month of May. Good luck, and thanks for stopping by!! I just got a new PTI stamp set and I was dying to use it. It's right up my alley as it looks like Zentangling. Truth be told, I'm not too keen on this card. I stamped and cut out the feathers and then colored them with SU ink in Rich Razzleberry and Tip Top Taupe by mushing the top of the ink pad down on the pad and then picking up the ink with my water brush. The card stock I used was the same Rich Razzleberry color, but I don't think they match very well. I did some scoring at the bottom with my score tool, and then stamped the patterned stripes with a border stamp. Hope you all have a wonderful weekend! Thanks for stopping by, I adore your comments! Yeah, it's snowing. And that's all I have to say about that. We in the card making community have recently lost one of our own, Tina Gilliland. I thought a butterfly card to send to the family was appropriate....butterflies always give me peace. I used 2 Cherry Lynn butterfly dies on this one. 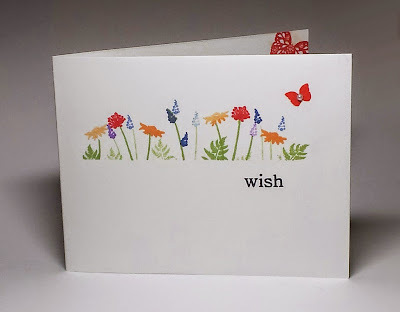 First I stamped a fairly large butterfly image from Paper Wishes with GKD Innocent Pink Ink. Then I attached 2 different butterfly die cuts on top. I think it looks rather delicate and pretty. Thanks for stopping by, I adore your comments. Have a happy weekend, dear friends. Happy Friday, I hope you have a wonderful weekend. 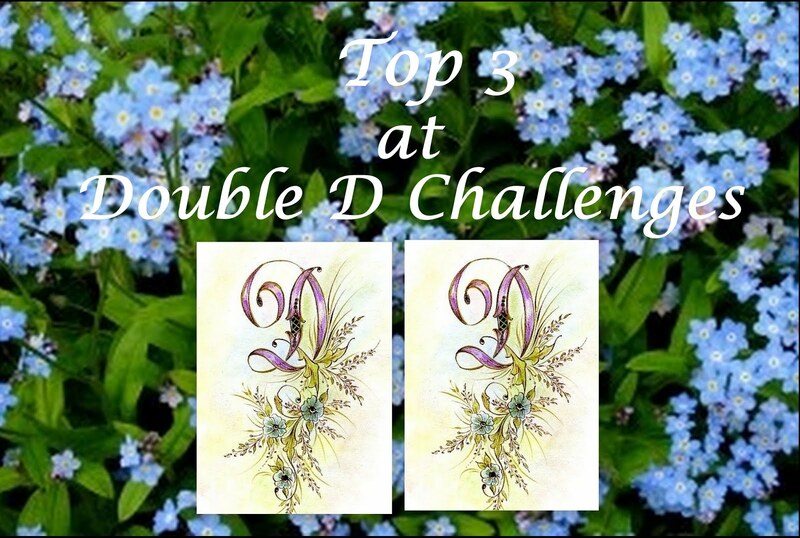 For today's card I decided to try out something that I saw Jennifer McGuire do the other day. You can see the video that inspired me HERE. I thought it was so fun to use the vellum as part of the card front. The only thing I wish I had done differently was move the white element up more, I liked the way Jennifer's looked better. This is a better look at the vellum, and inside patterned paper. Thanks for stopping by, I adore your comments! !